Can My Home Inspector Perform My Septic Inspection? Some home inspectors offer septic inspections as part of their service, but wise home inspectors realize the liability of the limited inspections that they offer. As we all know, general home inspections are just that — general. If you really want know the condition of the septic system at a home, you need a specialist. Let’s say you want to buy a used car. You walk around the vehicle and it looks pretty good — the tires are in good shape and there are no major dents. You purchase the car without test driving it or popping the hood. If you really want to know the condition of that car you’re buying, however, you inspect it inside and out for potential problems and take it for a spin. The first situation is comparable to a “visual” septic inspection (also called stress test, dye-test, etc). Most home inspectors offer visual inspections by running water and flushing commodes; the system is assumed acceptable if the house does not experience any backup or seepage over the yard. Learning the true condition of a septic system requires opening and checking the tank, and in most cases pumping it to check for backflow from the absorption area. This is a “full” septic inspection, and uncovers many common septic system problems that a visual inspection misses. Accepting a visual inspection is a big gamble because you’re basically purchasing it “as is” with the home. We have found major problems even with newer systems and tanks that have been recently pumped, so don’t let that information fool you into thinking everything is a-okay. 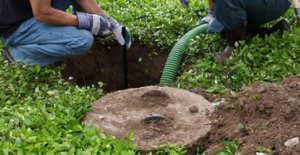 A new septic system can cost $12,000 to $15,000 or more in the San Antonio area, so there are many reasons to get the septic system inspected before purchasing a home. Our technicians are NAWT certified inspectors, and perform over 300 inspections every year. Please call us at 210.698.2000 (San Antonio) or 830.249.4000 (Boerne) or contact us online to discuss scheduling a septic inspection.